Feel free to contact us for any reason. We welcome your suggestions, feedback, comments, frustrations, you name it. Just click one the email links below to send us an email. We will normally respond within a day or two. 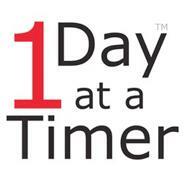 Do you have any suggestions or comments regarding the One Day at a Timer? We are very interested in hearing what you the users of this application have to say. We welcome enquiries from media organizations regarding the One Day at a Timer. We have logo artwork, screen shots and more in depth information about this unique tool available upon request.